Fairy Fencer F is from the makers of the Hyperdimension Neptunia series and stars the always hungry slacker Fang. After he draws out a fairy-imbued weapon (called Furies in the game), he decides to help his fairy, Eryn, find her lost memories and get his wish granted... for more food. Honestly, each character I met in the game was pretty unlikable at first, but they slowly grew on me. The dialogue is often pretty funny and the story flows quickly. The character art is nice, and even the battle models look good. However, there are several enemy models that are pretty much copy/pasted from the Neptunia games. The flow of the game is pretty simple. You get one or more events in town, then a dungeon opens up. Complete the dungeon and return to town, rinse and repeat. There are quests to do for extra money and items, which gives you more reasons to return to each dungeon. One nice addition to the formula is altering dungeons. You acquire more furies as the game progresses, and through Godly Revival (more on this below), give them skills that will affect a dungeon if they are stabbed into the ground near them. These can be simple, like giving more experience or money, or more complex, like changing what enemies are in the dungeon. There's even an optional area that gives more enemies to fight the more furies are stabbed in the ground. The furies can be moved or taken back at any point on the world map, so don't worry about putting them down when you need to. Combat will look a little familiar if you've played the Neptunia series. You fight in a predefined area and can move within your radius on your turn. Normal attacks can only hit one target, but skills can be positioned to hit multiple enemies. You can also purchase combo slots and different attacks to put in them, customizing your attack string. The fury your characters get can switch forms to other weapons as you make your way through the game, and each type has different advantages from each other. The combos you have are put together from whatever attacks you purchase and equip, so you can, for example, start with a sword attack, the next hit will be a spear, then end with a gun attack. It's really fun to set up the combos, and you even get attacks that will launch your target. Granted that's not useful until you get a further combo slot, but then you can follow them up into the air for more damage. Another aspect of battle is the Avalanche attack. If you hit an enemy with a weapon type that it is weak to, and at least one other character has their turn next, there is a chance you will get an avalanche attack. This basically extends your attack by letting your other characters join in, and doesn't cost them their turn. While that is really nice for upping your combo count and damage, the random nature makes it too unreliable. More often than not it would start one just as I was hitting the button for my next combo attack, and it would mess up my fancy chains. It was unfortunately hard to make the best use out of the feature, but at least it doesn't hurt you in any way, so I can't complain too much. The last unique aspect of combat is the Fairize command. When your tension meter is over a certain point, you can merge with your fairy into a powered-up state. Besides looking pretty cool (if impractical), your stats are boosted and you get access to a super attack. The super is pretty strong, but sadly takes health and mana to use. It doesn't kick you out of the Fairize state, which I would expect it to. I have to say that I would prefer it not take health, but drain your tension gauge. I would have used it much more if it behaved like that. As it is, I tried to use it to finish a boss fight, mostly for the cool factor, since I would be close to dead if I misjudged it. Overall, combat is really fun. The biggest complaint I have is sometimes it is hard to tell what monster(s) are targeted for an attack. There is a marker above your target(s), but sometimes it is hard to see. I rarely hit the wrong target, but it sadly did happen a few times. Getting experience levels you up like other RPGs, but there are other ways to boost your party and customize them slightly. You gain weapon points (WPs) for each victory, and they can be used to increase stats, buy magic, attacks and other things. Most skills, abilities and magic will have prerequisites, so it can take a bit to get the really good attacks. I always like buying skills and stuff in games, so I really liked all the different things you could get. This menu is where you will buy combo slots and weapon attack to fill them. The character challenges from Hyperdimension Neptunia V return for this game and give you further opportunity to strengthen your party. Healing, using skills and items a certain amount of times will give small stat boosts. Whoever you set as the party leader will also be able to earn other challenges, like jumping or getting preemptive strikes. I liked them in Neptunia V and I like them again in Fairy Fencer F. They aren't necessary, so if they aren't your thing you can ignore them. Personally, I liked to rotate my leader and spread around the challenges to try and keep my people somewhat even. While your fairy partner is set and cannot be changed, you can also equip a second fairy that gives you different skills. Most skills they will get upon leveling up, but there is also a way to get them. One character allows you to place a fairy in an inactive fury used to seal the two deities, called Godly Revival. After you complete a fight, the fury is now yours to use on the world map, or equip the fairy for different skills. A fairy can only be put in an equivalent tier weapon (C, B, A or S), but you can choose what order to do them in and which weapon to use what fairy on, so it's a pretty open system. There are some very useful skills you can get this way, like restoring some HP after a fight, or restoring yourself completely when using the Fairize command. While it is yet another way to make your characters stronger, it was fun to get a fury for my new fairies and raise them all to level 10 and see what skills they would get. Plus, if you fight with them enough, they give you some items. It takes awhile to make your way through the game, as it took me over 40. The game isn't very hard and you don't need to grind, especially if you do a lot of the quests and sub events (like me). A lot of the sub events are very easy to miss, which can make you miss out on extra fairies and even playable characters. That's my biggest complaint overall with the game. You can miss stuff very easily, and you can't actually do it all in your first run. However, there is a new game + which allows you to keep your level, items and money, making it easy to go through the game again. If you are a completionist like myself, there is good replay value. Plus, if you are going after all the trophies, you will have to put even more time into it, mostly for the money trophy. Unfortunately, the list is mostly secret, so you will have to look up those in addition to seeing how to get all the stuff you likely missed. I had a lot of fun playing Fairy Fencer F. The combat was my favorite part, having high-hitting combos and launching enemies into the air for juggling attacks. There are several ways you can make characters stronger and I enjoyed using them all. The only real downside to the game is how easy it is to miss things, but the new game + option makes it easier to deal with. It was hard to pull myself away from the game, as I kept wanting to play. I highly recommend it to RPG fans, especially if you enjoyed the combat in the Neptunia series. I've had a chance to try the PC version of the game. It ran well on my i7 desktop. 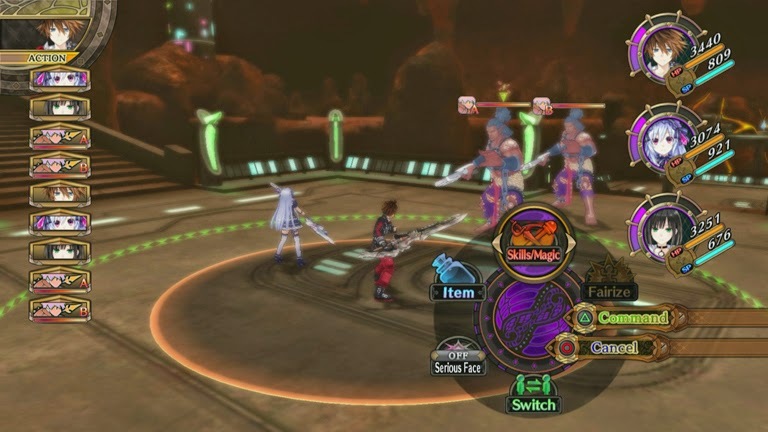 Like other Idea Factory International games on the PC, the graphics look a little better and a controller is superior to use for the game, although you can use a keyboard and mouse. The cut-scene graphics don't like as nice as the Neptunia ones, but they don't look bad, either. If you don't want to wait for the PS4 psuedo-sequel coming out later and want the best looking version of the game, then the PC copy is the way to go.